A monument commemorates the Major Mitchell expedition which passed through the area in 1836. Thirty-six cairns or tablets to Mitchell were erected at Nyah West, Swan Hill, Cohuna, Mount Pyramid, Fernihurst, Wedderburn, Kanya, Stawell, Mount William, Horsham, Mount Arapiles, Miga Lake, Harrow, Coleraine, Casterton, Dartmoor, Isle of Bags, Portland, Mount Rouse, Mount Napier, Hamilton, Lake Repose, Dunkeld, Middle Creek, Mount Greenock, Skipton, Mitchellstown, Nagambie, Castlemaine, Expedition Pass, Kyneton, Benalla, Wangaratta, Chiltern, Gooramadda and a public park at Natimuk (Major Mitchell Park, Mtount Arapiles, Natimuk). Nagambie, Friday. 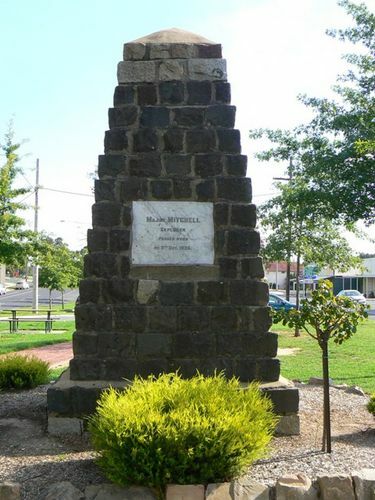 Major Mitchell in his travels of 1836 visited the site of the now thriving town of Nagambie after he had passed through Mitchellstown. The origin of the name of Nagambie is the subject of conflict between authorities on aboriginal dialect. An enthusiastic committee workmg under the dnection of the head master of the Stale school (Mr. R A Lester) organised an appeal for funds for a monument to the memory of Major Mitchell, and today, in a reserve, in the main street school children and residents gathered around a bluestone monument bearing the inscription "Major Mitchell explorer passed here on October 9 1836." Before the memorial was unveiled by Sir James Barrett, Mr C. S. Daley remarked upon the foresight shown by Mitchell, who in those days had "prophesied" that Victoria, or as it was then known as Port Phillip Colony, was suitable for intense cultivation, water being provided from conservation areas on the great river system of the northern districts. Excerpt from Argus (Melbourne), 3 May 1930.